Product prices and availability are accurate as of 2019-04-22 22:55:57 EDT and are subject to change. Any price and availability information displayed on http://www.amazon.com/ at the time of purchase will apply to the purchase of this product. Kitchen, bathroom, pans, barbecue: apply 1 tsp. on a sponge, thoroughly scrub, and rinse with warm water. Floor surfaces (tiles, terracotta, wood flooring, plastic coating): mix 2 tbsp. of soap for 5L of hot water, clean the surface, and let it dry. Gardening: avoid greenflies by mixing 5 tbsp. of soap for 1L of water in a spray bottle, then spray on plants and flowers. Laundry: use 3 tbsp. of this liquid soap in the detergent dispenser of your machine for 5 kg of laundry. For best use, regularly pour a glass of white vinegar into your fabric softener compartment. You can use the same proportions for washing by hand. Stains: apply 1 tsp. and thoroughly scrub the stain; let it rest for a few minutes before placing in the washing machine or washing by hand. Precautions: Keep out of reach of children. Do not mix with other detergents. Yumi Bio Shop Exclusive Product - A free Sample of one of our products with every shipment! 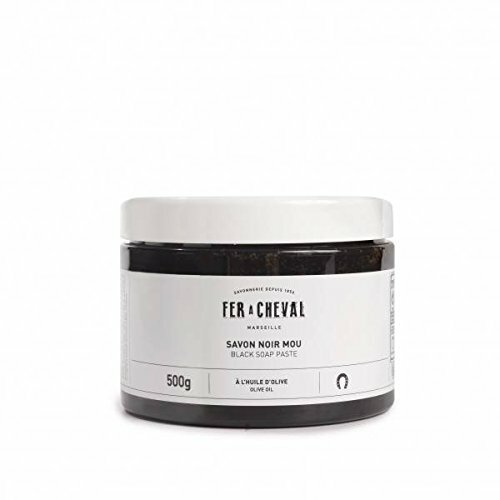 The Black Soap Past is an environmentally-friendly and multi-use cleaner; its concentrated form makes it more economical than its liquid version. little dose is enough to thoroughly clean, degrease, nourish and polish all kinds of interior or exterior surfaces. It also removes difficult stains on clothes or linen. Formulated from olive oil, and without any conservatives, dyes or fragrance, it is an environmentally-friendly detergent. More than 30% soap.